SHRM-SCP, Society for Human Resources Management-Senior Certified Professional, Certified Human Resources professionals with experience maintaining proper Federal and State compliance for business processes. Experience implementing web/client based software solutions at low cost, rapid implementation, and training. Human Capital Management approach to maintain high retention rate, proven by past performance as HR/Operations managers for small business. Certified Facilities Security Officers who can coordinate and maintain proper compliance with Federal and State regulations. We enhance small businesses DSS Vulnerability assessment ratings from Satisfactory to a Commendable rating. We enhance large non-for-profit business DSS Vulnerability assessment rating from Satisfactory to Superior. Our experience in the community, and as a Chair on National security organizational boards, we know, who to know, to get things done in the Security realm. We have relationships with security representatives in State, Army, DoE, OPM, Census, and other organizations. We develop web sites for events. We can create your event focused website quickly and creatively. Web storefront for businesses desiring a new revenue stream. We can create your unique email addresses specific to your company. Branding and marketing are pivotal to your success and we support you with our knowledge and skills in the industry. Custom emails related to your website and custom business card support for small businesses. 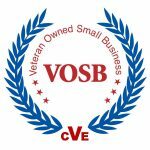 We are a Veteran Owned Company. We have a team of retired military, former military, and spouses of military members supporting and team. We have experience and knowledge of the DoD operational world.